Brittany Joyce Elmslie OAM is an Australian swimmer. She represented Australia at the 2012 Summer Olympics in swimming. Nicknamed Brit, Britty and Bidz, Elmslie was born in Nambour, Queensland. She was named a 2011-2012 Young Star Sport Award winner for the Northside Chronicle. As of 2012, she lives in Brisbane, having moved there from Noosa in 2011 in order to improve her chances of making the Olympics. Elmslie is a swimmer. As of 1 July 2012, her best time in the 100 metre freestyle of 54.02 seconds was set at the 2012 New South Wales State Championships. Her best time in the 50m freestyle was 25.34 set at the 2010 Australian Age Championships. Her best time in the 200m freestyle was 1:59.47 set at the 2011 Queensland Championships. Her best time in the 100 butterfly was 1:00.41 set at the 2011 Queensland Championships. She is a member of Nudgee Brothers Swimming Club Inc.
At the Guam hosted 2009 Junior Pan Pacific, Elmslie finished first in the 50m free event and fourth in the 100m free event. 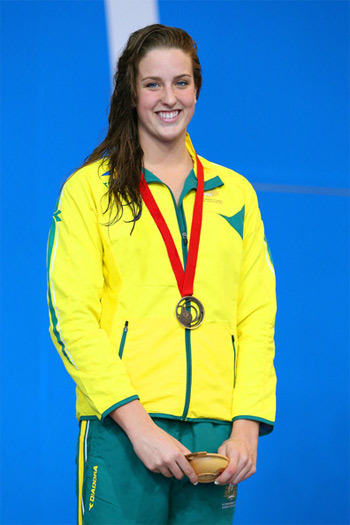 At the 2010 Telstra Australian Swimming Championships, she made the finals in the 50m freestyle event. At the Hawaii hosted 2010 Junior Pan Pacific, she finished third in the 4x100m free event and fifth in the 50m free event. In 2011, after moving to Brisbane to join other swimmers coached by Matt Brown, Elmslie increased her training regime and lost 6 kilograms (13 lb). Her training partners included Emily Seebohm. At the 2012 Australian National Championships, she set a time of 1min.57.24s in the 200 metre individual medley. She was selected to represent Australia at the 2012 Summer Olympics in the women’s 4 x 200m freestyle swimming team event in her first Olympics. Going into the Games, her team was considered a medal favourite. She was set to compete in the Olympics as a teenager. At the 2013 Australian Swimming Championships she won silver in the 100 m butterfly and bronze 50 m freestyle events, qualifying for the 2013 World Aquatics Championships. At the World Championships, she teamed up with Bronte Campbell, Emma McKeon and Emily Seebohm in the heats of the 4×100 m freestyle, finishing second in their heat and overall. In the final sisters Cate and Bronte Campbell, Emma McKeon and Alicia Coutts won the silver medal, finishing 0.12 seconds behind the United States. Brittany Elmslie and Bronte Barratt went head to head in the women’s 200 freestyle, which was one of the most exciting races on the final evening of the Victorian Open Championships. Going into the final 50 meters Elmslie had a lead of 71 one-hundredths of a second, a lead she was able to hold despite a fast charging Barratt. Elmslie took the event in a time of 1:57.44 followed by Barratt who finished in a time of 1:57.57. She has been awarded the Medal of the Order of Australia (OAM) in 2014 Australia day Honours list. She and her Australian women’s 4X100 freestyle relay team was named the winners of the Golden Moment of The Year at the 2012 Australian Swimming Awards for winning gold medal at the 2012 Olympic Games in London. She was also named Discovery of the Year by the Australian Sports Commission in 2012. Brittany Elmslie is winner of one Olympic gold and one silver medal and winner of two silver medals at the World Swimming Championships. She is in conversation with Namita Nayyar, President Women Fitness.